« It’s the second Wed in the month…so it must be Release Day for Flourishes! Today I want to walk in my garden, My Fantasy Floral Garden, that is…..each card is one from the Garden, but not a rose garden! Each and every day we are given the exact number of minutes and hours, breaths and options. How and why we make the choices to live it is important. Having watched the airing of “The Last Lecture” with Randy Pausch, then receiving the book as a gift, I knew it was time to live life and smell the garden. If you have not had an opportunity to ready this wonderful book, I strongly recommend it. I know everyone that reads this blog must wonder just what was up in my world that I would not have any time at all to create and post. Believe me when I say that life has been playing real hard ball in our lives. Both Mike and I had unexpected surgeries, coupled with the death of a young infant in the family, as well as a multitude of other challenges….life was taking it’s toll. On the positive side, but stressful as well, we took some time away to attend CHA in Chicago. It was great fun, wonderful to see Flourishes images being used in THREE major booths, on items displayed or for demo. Of course that kind of travel also has it hiccups and this trip followed the norm. Returning home proved even more challenging. Many changes were taking place, important decisions needed to be made for Flourishes. New products for the store are arriving daily and well into Fall. We think we have made some wonderful choices and hope you will enjoy them as well. Owning and running a small women owned business is to say the least challenging. It takes all of our cumulative time, skills and a delicate balance to keep things on an even keel, much less moving forward and growing as Flourishes has done. The total support of our husbands and families is a necessary aspect. I am truly blessed that Mike is a loving and active part of Flourishes. Nancy and Sharon’s husbands are wonderful as well. Blogging and creating is an important part of my life, an aspect that I need. It is my sincere wish to let this aspect not be overshadowed and to make time for it. I hope you will all continue to visit. 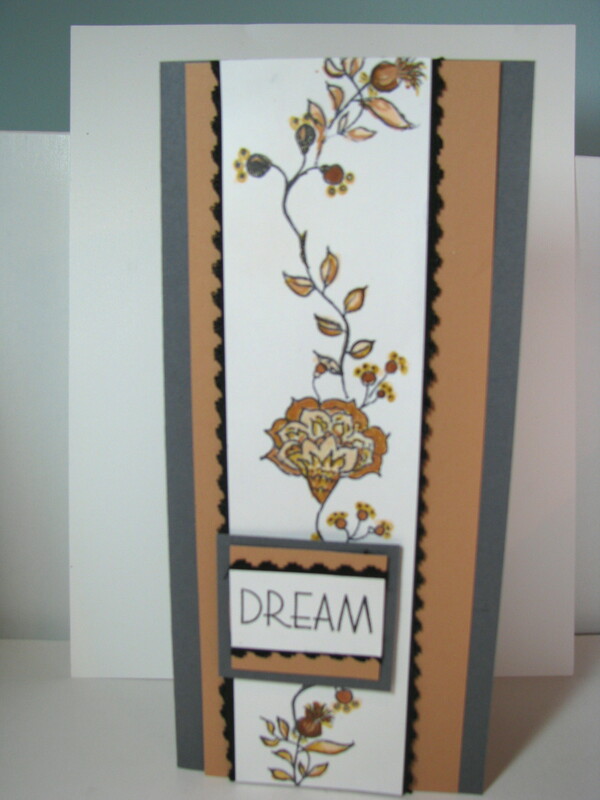 The Cards are all made with the Fantasy Floral Garden set, all supplies are also from our webstore. . I love this set, It is so versatile and allows for creative juices to go in many directions. I hope that you have enjoyed this stroll thru my Fantasy Floral Garden. 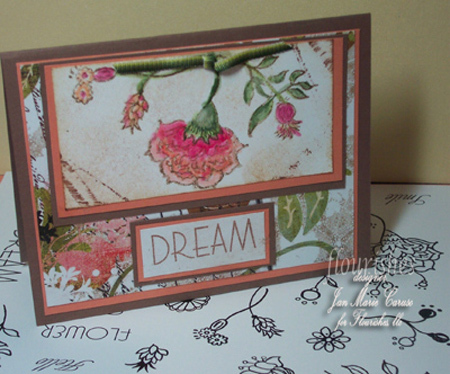 Please visit the “garden” cards created by the Flourishes Design Team as we are all highlighting this set today. Trust me you will not be disappointed. Faith, Julie, Leslie, Susan. Thanks for stopping by the Atelier today….the door will be open more often, please come again! Wow! Jan you have made some truly gorgeous cards. Your garden is beautiful!! Thanks for the insight Jan Marie. I think it’s a message we all need to hear. Ironically, I just picked up Randy’s book yesterday. He is an amazing man and I cried when I heard he was no longer with us. We all knew he wouldn’t make it but I was praying for a miracle. His lesson is profound to seize every moment! Thanks for sharing and for sharing your beautiful “garden” as well! Jan Marie, all these cards are beautiful, as is your lovely insight into your life. I think we all try to enjoy every moment, and to live knowing that our lives here will be reflected in not how long we spent here, but in how we spent each moment. Lovely trip through your Garden. Your garden is lovely, Jan Marie. I’ve looked at that set many times but haven’t been moved to get it. It is on my list though. I can appreciate how life hands us many challenges as we move along. Thank you for sharing your “garden” and your thoughts. 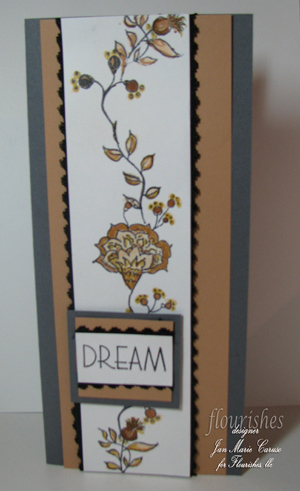 Beautiful thoughts and beautiful cards! Thanks for sharing! Fantasy Floral Garden is probably my favorite Set from Flourishes. 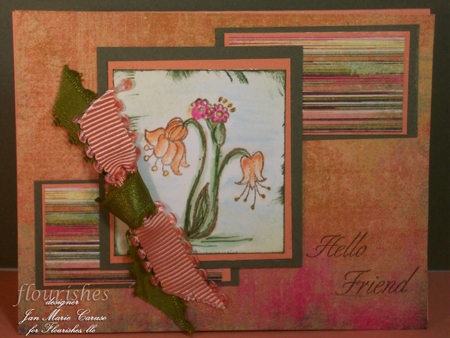 Its nice to see you blogging and your beautiful cards. Life is so precious most people fail to realize this until its too late. I saw “the last lecture” what an amazing human he was, I was so sad to hear of his passing. I didn’t know he had a book, I will have to go and get it. I hope both you and Mike are doing better after your surgeries…take care of yourselves. Your cards are beautiful. What a beautiful stamp set. All the cards are elegant and attractive and so feminine…love them all. As always,,,great visiting your blog. Really beautiful cards, Jan, and a philosophy that bears careful consideration. I think about this over and over again. Thank you for sharing both your lovely work and and your thoughts. I am so sorry to hear that you have been going through some tough times recently, I will keep you and your family in my thoughts. Your cards are all stunning and I will continue to visit even if the posts become sparse, we all have obstacles in our life and I know that I am not the only person that understands that. Hope things look up, I can’t wait to see what Flourishes has to come, so far everything has been wonderful! First, hugs to you. I am so sorry for all of your personal struggles. I used to think that “if only [blank] would [or would not] be happening, everything would be ok. Now I realize that this is life! Second, love your cards and your company. I’m looking forward to the release tomorrow of new sets. I thhogut finding this would be so arduous but it’s a breeze!